Do you love our large-hole hippo beads but have no clue what to do with them? Here's the bracelet for you! It's a sturdy, silver-plated over base metal bangle cuff bracelet with screw off ball ends that will fit most wrists. Simply screw off the ball end to add additional beads. 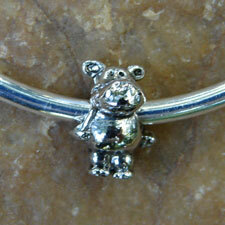 You can fill the entire bracelet with hippos or choose decorative accent beads to your liking. Our bangle will fit Pandora, Biagi, Troll, or any bead made for European cable style jewelry. Approximately 2 3/4" by about 2 1/2" .